You emerge from the depths of the Dupont Circle metro station, cell phone clutched in your hand. You bring up the mighty powers of Google Maps on your smart phone and type in the name "Bier Baron Tavern." You follow the blinking arrow down cold streets until you arrive at the awning and realize, oh right- it's the old Brickskeller. Oops. You head into the bar, where you see tables arrayed throughout the room where the house manager, over the live music provided by folks who you assume will be the cast for the evening's show, explains that it is very important that you Move Nothing, Not Even a Chair, unless it be to Sit in That Very Chair, which you do. A nice man brings you beer. An actor walks over to ask in a charming accent if you can start ripping up your napkin to make snow for an upcoming blizzard. And, gentle readers, if you are me, you start to wonder if maybe you've stumbled into a little slice of live theatre heaven. 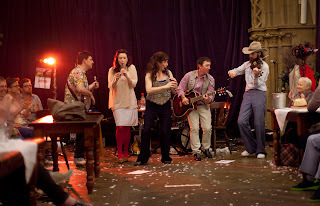 Photo of David McKay, Alasdair Macrae, Melody Grove and Andy Clark in the National Theatre of Scotland’s production of The Strange Undoing of Prudencia Hart, presented at the Shakespeare Theatre Company. Photo by Drew Farrell. Because there's something magical about director Wils Wilson's The Strange Undoing of Prudencia Hart, presented by the National Theatre of Scotland, once more being hosted by the Shakespeare Theatre Company (and long may this relationship thrive!). There's something wonderfully Chaucerian about the journey I describe above- you wonder through the cold until you come together with fellow travelers over a pint while someone tells you a story. There's magic in the story told by the ensemble- written by playwright David Greig, Prudencia weaves a tale that mixes myth and epic with the modern and the banal, one laced with poetry and humor throughout. I'm a sucker for just this type of storytelling, it's true, but that also means I have a practiced eye when I tell you that this new variation on a Border ballad theme is a damn good one. There's a lot going on in the play, lots of interesting choices being made, but never at the expense of good storytelling. I could go on at length about the verse and the thrill of the moments when couplets disappear into other poetic forms or how it feels when you realize that prose has managed to sneakily assert itself when your eye was elsewhere- but I could also tell you that I whooped with laughter and almost knocked over my drink with a flail of delight. Prudencia makes use of narration for huge chunks of text, but at the same time, it depends absolutely on its own theatrical form; for all the verse, this is no poetry reading. 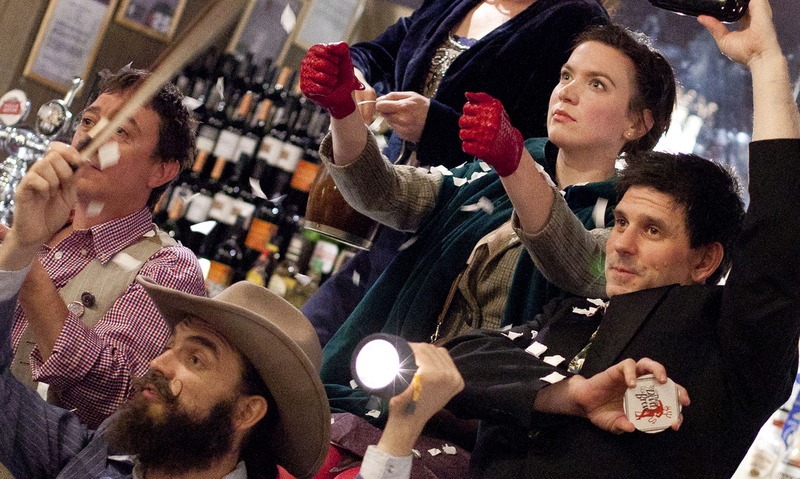 From a napkin-fueled blizzard, to the delight of watching an unsuspecting audience member become a motocycle, this marvelous ensemble of actors (and there's not a weak link in the lot) is brilliantly skilled at playing with their audience. There's a subtle art to audience interaction, one that you learn by doing- how to invade someone's space without assaulting them, how to single out an audience member in a moment but bring everyone back together in the very next breath- and I was impressed again and again with how effortless this ensemble made it all look. I don't take extensive notes when I go to the theatre, but I do scratch out important words to come back to when I write a review. Midway through the piece, I wrote down "communal theatre, around and through and with the audience." The audience and the space are crucial to this production, and cheers to the production team in selecting a fabulous venue for this piece. When the lights stay on, when the actors walk between and on top of your tables, when you can cheer each other on and sing along with actors and audience working together- it's communal, it's all that I love about live theatre. The actors need the audience and the audience need each other and the actors, too- we're all working together to tell a story where most of us don't even know the ending yet. Photo of Andy Clark, Melody Grove, Annie Grace, David McKay and Alasdair Macrae in the National Theatre of Scotland’s production of The Strange Undoing of Prudencia Hart, presented at the Shakespeare Theatre Company.Photo by Drew Farrell. I'm a little bit in love with The Strange Undoing of Prudencia Hart, but I walked out of the Tavern feeling more than a little bit in love with the miraculous potential of theatre all over again. I may also have started to shamelessly proposition an imagined personification of the entire National Theatre of Scotland, but that's neither here nor there. Please- do yourself a favor and go see Prudencia before it leaves us all for other shores as it continues on its international tour. It's funny and wise and beautiful and joyous and damn good theatre and I just can't get it out of my mind. Thanks again for supporting the company out on tour. It is wonderfully warm write ups like these that makes us feel at home, wherever we are in the world.